Well, as you know Noah had his Pumpkin Party at Ms. Jas' yesterday. The popcorn chicken was a hit! They had so much food, they did not know what to do with it. 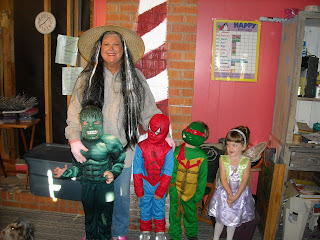 Ms. Jas only has five in this little preschool, so it did not take much for them. They had a ball at the party. Us moms did a great job! Yeah Moms, we had popcorn chicken, chocolate cup cake, pumpkin cookies, chips and cheese dip, Haystacks made out of wienies and crescent rolls, Kool aid and lots of happy bags! Great day for all of them. 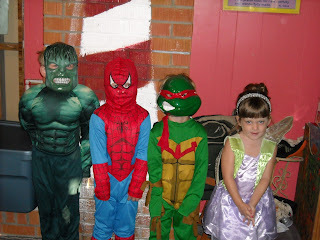 We had SPIDER MAN, HULK, NINJA TURTLE, A PRINCESS and A BALLERINA! Ms. Jas was a LADY GARDENER! Let me see if I can get this right, please forgive me if I don't! SPIDER MAN was Noah McCormick. The HULK was Shane Arnold, the son of Lacy Ezell. The NINJA TURTLE was Miller Lloyd, the son of Carrie Miller Lloyd. The PRINCESS was Krisalynn Jackson, the daughter of Brad Jackson and granddaughter of Kay Jackson. The BALLERINA was Hannah Jones, the daughter of Ty and Melanie Jones. Hannah was scared of the HULK so I am sorry for not having a picture of her. I will get some pictures of her at the THANKSGIVING FEST! They were all precious! Keep up the good work with the children...you will be blessed. Okay, this is one of those pictures that is sure to end up in the annual his senior year! How sweet! All WAS good. . .